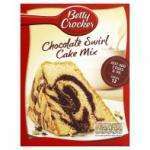 Betty Crocker Choc Swirl Cake Mix , Devil's food cake mix, carrot cake, chocolate & vanilla icing, Choc Fudge Cupcake Mix all £1 each. They make excellent moist cake...so easy to make. thanks for this m8, my wife's making the kids a mummy cake for halloween & this is the mix she was gonna use. now what icing should i get with that choc fudge or vanilla? Betty Crocker!!! --- sounds like some right dodgy old bird. Mmmmmm, nice, I'll have to make myself go to Asda now. Depends on whose crack you're talking about. Brilliant, just what I need. I have 3 wedding cakes to make, perfect! Be aware, there's some rather unsavoury stuff in these mixes in the way of preservatives and processed fats. You're better off buying a cake really! It may be unsavoury to you but I find it absolutely delicious. ohhh no I was looking ffwd to the photo. That's why i always buy nonstick cake molds...perfect cake everytime. U can try again some other time but dont forget to grease the tin well...Good luck. Get those silicon ones. They never stick to those. ohhh no I was looking ffwd to the photo.That's why i always buy … ohhh no I was looking ffwd to the photo.That's why i always buy nonstick cake molds...perfect cake everytime.U can try again some other time but dont forget to grease the tin well...Good luck. This looks so yummy X). Ohhh woww.This looks so yummy X). 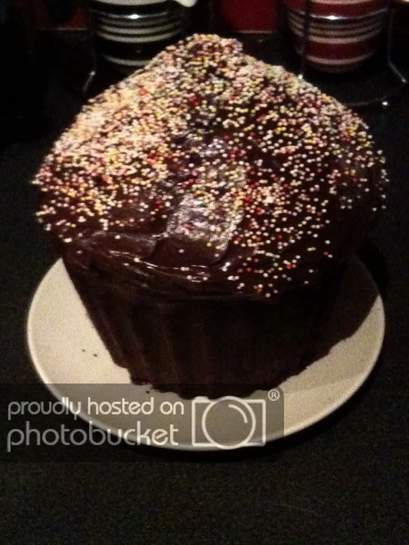 Yes i was wondering u must have used 2 betty crocker mixes to make the giant cupcake. My kids also like to decorate with the sprinkles but i dont use icing. I spread nutella on top. Your cup cake is impressive, well done! It does brilliantly. Just try not to lick too much of it off the knife/spatula as you put it on.